Pencil made of lead with a decorative end; it was first used in the Middle Ages and was later replaced by the graphite lead pencil. Curved point mounted on a handle; it is dipped in an inkwell to write. Pointy metal instrument used by the ancient Greeks to etch wax tablets; the flattened end was used to erase etching. Large feather with a hollow stalk (calamus) that is sharpened to a point and dipped in ink to write; it was used in the Middle Ages. Instrument that was used from antiquity through the Middle Ages to write on papyrus and parchment; it remains the traditional instrument of Arabic calligraphy. Small reed that is sharpened to a point and used to draw hieroglyphics on clay tablets or to write in ink on papyrus. Natural or synthetic bristles set into a handle and dipped in ink to write; it has been used for Chinese calligraphy for 4,000 years. 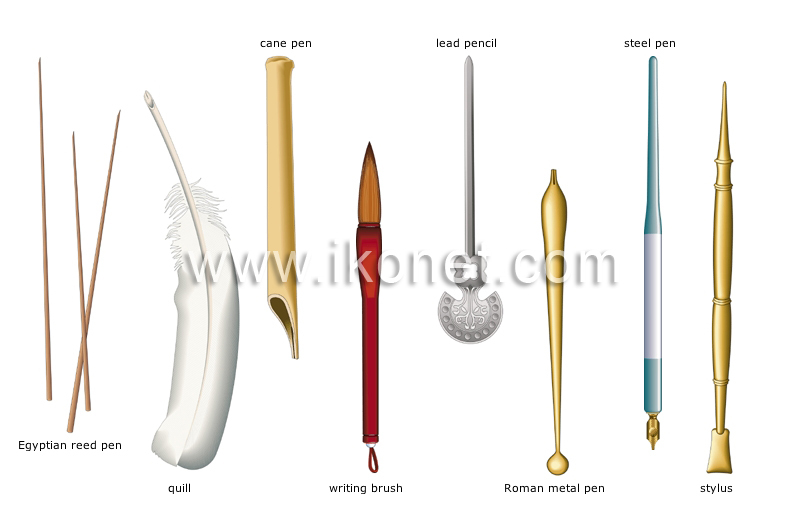 Metal writing instrument devised by the Romans in ancient times; it is the ancestor of the modern metal pen, which appeared in the 19th century.